LAS VEGAS, NEVADA, April 13, 2018 – In an effort to provide security professionals with best-in-class signal management solutions, Nortek Security & Control (NSC) today introduced its all-new line of Xantech® HDMI Distribution solutions. The new line – including extenders, splitters and switchers, matrix switchers, audio distribution solutions and a signal manager – is on display at ISC West 2018 in Booth #20015 in the Sands Exposition Center in Las Vegas, Nevada. The XT-HDBT-EX100-4K18G-KIT: 4K HDBaseT™ extender delivers HDMI 2.0 with HDCP 2.2 support, Bi-directional IR, RS-232 and PoH (PoE) up to lengths of 70m at 4K (100m at 1080p) over a single CAT cable. The XT-HDBT-EX70-4K-KIT: 4K HDBaseT™ solution delivers HDMI with HDCP 2.2 support, Bi-directional IR and PoH (PoE) up to lengths of 40m at 4K (70m at 1080p) over a single CAT cable. The XT-CAT-EX40-KIT: Slim-line extender provides HDMI distribution over a single CAT cable at an outstanding value and delivers HDMI & Bi-directional IR up to lengths of 40m @ 1080p and 50m @ 1080i. The XT-HDBT-SP14-KIT: 4K UHD HDBaseT™ splitter distributes a single HDMI source to four simultaneous HDBaseT™ outputs with HDCP 2.2 support. The XT-SP12-4K18G: 4K HDMI 2.0 splitter distributes a single HDMI source to two simultaneous outputs, and supports full HDMI 2.0 and HDCP 2.2 with video resolutions up to and including 4K @ 60Hz 4:4:4. The XT-SP14-4K18G: 4K HDMI 2.0 splitter distributes a single HDMI source to four simultaneous outputs and supports full HDMI 2.0 and HDCP 2.2 with video resolutions up to and including 4K @ 60Hz 4:4:4. The XT-SW21-4K18G: 4K HDMI 2.0 switcher distributes 2x HDMI sources to a single output and supports full HDMI 2.0 and HDCP 2.2 with video resolutions up to and including 4K @ 60Hz 4:4:4. The XT-SW41-4K18G: 4K HDMI 2.0 switcher distributes 4x HDMI sources to a single output and supports full HDMI 2.0 and HDCP 2.2 with video resolutions up to and including 4K @ 60Hz 4:4:4. 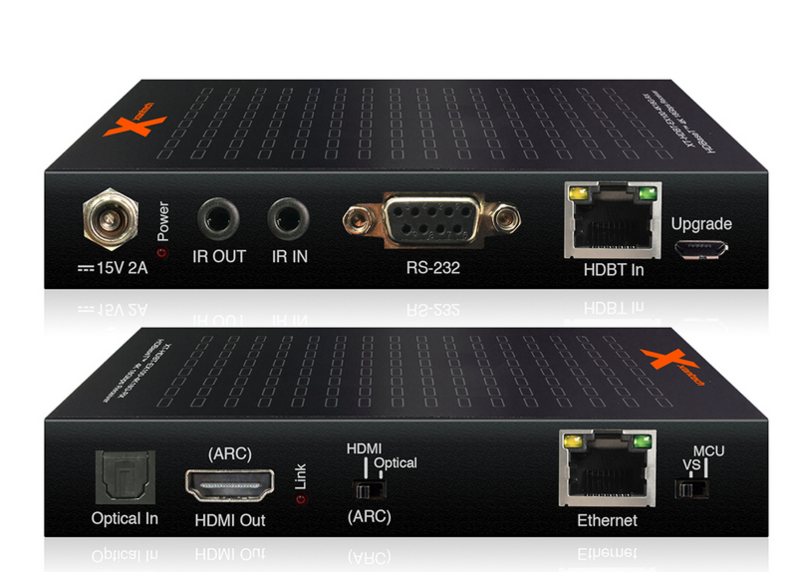 The XT-HDBT-MX44-4K-KIT: The 4×4 HDBaseT™ Matrix, a 4K HDCP 2.2 Matrix package, delivers HDMI, Bi-directional IR and PoH (PoE) up to lengths of 70m over a single CAT cable and includes simultaneous HDBaseT™/HDMI on output 1 and a web browser interface module for control and configuration of the matrix. The XT-HDMI-MX44-4K18G: 4K HDMI matrix features HDMI 2.0 chipsets with HDCP 2.2 support, allowing for the distribution of four HDMI sources to four displays. The unit transmits all HDMI resolutions up to and including 4K 60Hz 4:4:4. The XT-HDMI-MX42-4K18G: 4K HDMI matrix features HDMI 2.0 chipsets with HDCP 2.2 support, allowing distribution of four HDMI sources to two displays. The unit transmits all HDMI resolutions up to and including 4K 60Hz 4:4:4. The XT-CAT-ARC-KIT: Audio over CAT cable solution transmits digital audio signals up to a distance of 300m (192kHz signals up to 100m). This plug-and-play device will extend both optical and coaxial digital inputs concurrently. The XT-DAC-12: Designed to convert either coaxial or optical signals from a digital signal to analog stereo audio. This unit includes a digital converter for converting an optical signal to a coaxial signal. The XT-DIG-11: Designed to convert coaxial or optical digital audio signals from one signal type to another, this unit supports 192kHz sample rates for enhanced sound reproduction. Outputs are simultaneous so that audio can be distributed to multiple locations. Finally, the new Xantech HDMI-SM-4K18G HDMI Signal Manager is designed to help solve issues with HDMI compatibility, HDCP 2.2, clock stretching, EDID and handshaking that are common when distributing higher bandwidth HDMI signals over longer distances.